Who goes to Nevada? This woman. What would it be like to be near these old ones? Serene. The pines had needles that were older than I was. I was building up for an enlightening experience. It will be grounding. Some of the trees were over 5,000 years old. It would be an epic experience, one I would speak about with awe. Inspiring, I imagined myself saying, and then I’d whistle low, shaking my head as if Man, you won’t get it until you see them yourself. I had five hours and twenty-two minutes of wondering ahead of me. What would happen in the presence of the oldest living things on earth? 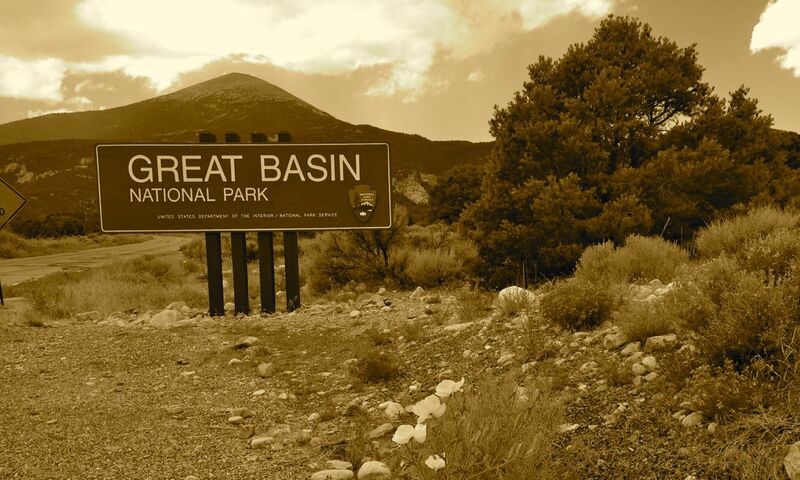 At the Great Basin National Park Visitor Center, I acquired the requisite park map. The ranger recommended Wheeler Campground at 10,800 feet. My phone jostled between Pacific and Mountain time as I drove up to the campground at the base of Wheeler Peak – 8,000…8,500…9,000…9,500…10,000 feet. 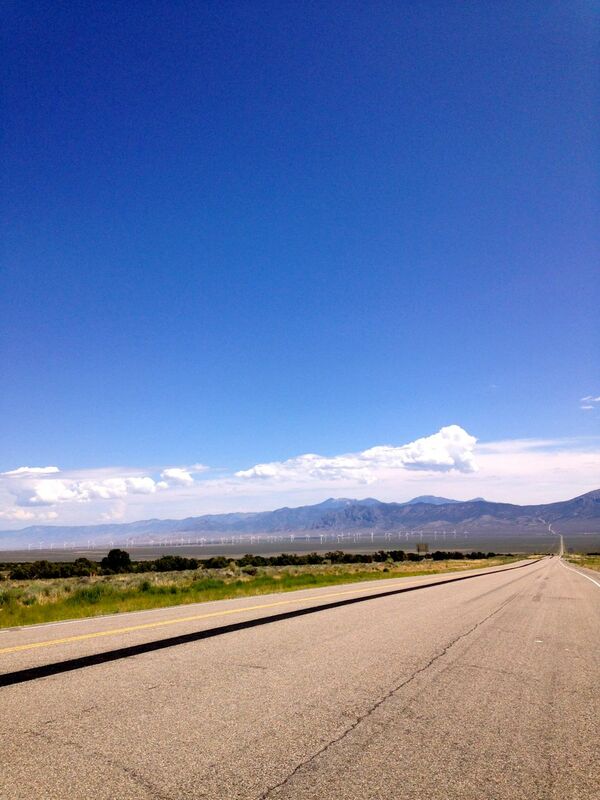 The road was solid with spectacular views of the Great Basin where, it turns out, water and rain flow into but never flow out. I made my round through the campground, settled on a spot but then found a better one on the upper, less-traveled loop of the campground. Campsite #19 was for me and it was a bonus that I was on the edge of the woods and, because this isn’t a high-traffic park, allowed to collect any downed lumber for campfire wood. 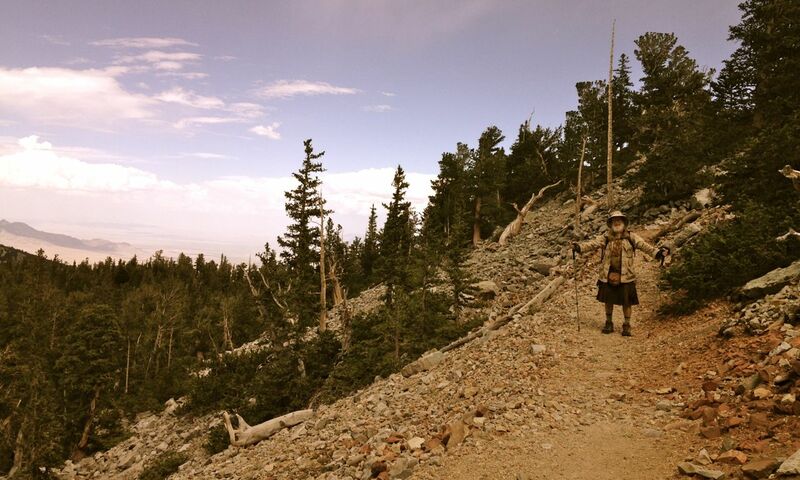 Once I set up my tent and packed my 10 Essentials, I headed for the trail to the bristlecone pines. The trail began in the woods and wound its way up 600 feet for about 1.7 miles, almost out of the tree-line. I met an old hippy in tie-dye and a kilt. “How are the trees?” I asked and smiled. “Sacred, that place is sacred,” He smiled back and let me take his picture but didn’t hear me when I remembered to call out and ask his name. A perfect entrance to the grove, I thought, sure that he was a guru of some kind. I arrived at my first bristlecone pine tree with a couple from New Mexico on their first roadtrip as retirees. I took their picture, they took mine, and we wandered further into the grove. To say the place feels sacred is an understatement. I put my hand on a tree and let myself rest in the wind sounds. Many of the trees looked half dead. Sap dripped from places where the elements had torn off branches. The trees’ roots were anchored in a little grove hollowed out between the boulders but it didn’t look like there was much soil. Researchers sometimes had to take four or more core samples from the twisted pines to determine their age. The cores do not harm the trees – within minutes, the sap fills in the holes. Adverse conditions prevent the trees from growing too fast. A plaque noted that bristlecone pine trees which grow too fast (have good growing conditions) often die. They need the adversity of the wind and snow to slow their growing and make them strong enough to survive centuries. 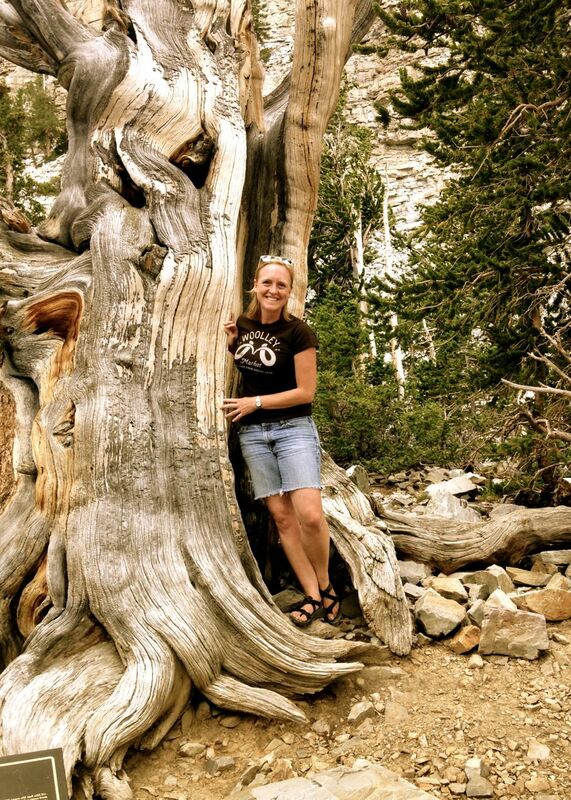 The oldest trees were stout and mangled, proof of their long-standing strength. I paused. I had thought all day about sitting quietly and opening my heart to the future, to my own adversities and how I was strong. This was going to be intense. Then a voice popped in from behind one of the old ones. It was a young voice. “Pardon me, but would you happen to know if this is the way to the GLACY-er?” It was an English voice like the Grey Poupon commercials belonging to an early 30-something-year old fellow wearing (mind you…on a hike) a linen sport coat. “I…I’m not sure,” I was laughing because he knew he was out of place and laughing too. His buddy wore a polo shirt and shorts. He carried only a massive camera to document the event. He looked slightly amused, slightly annoyed at how his friend hauled him up to this place. “I think that’s the trail. I’m headed there too. 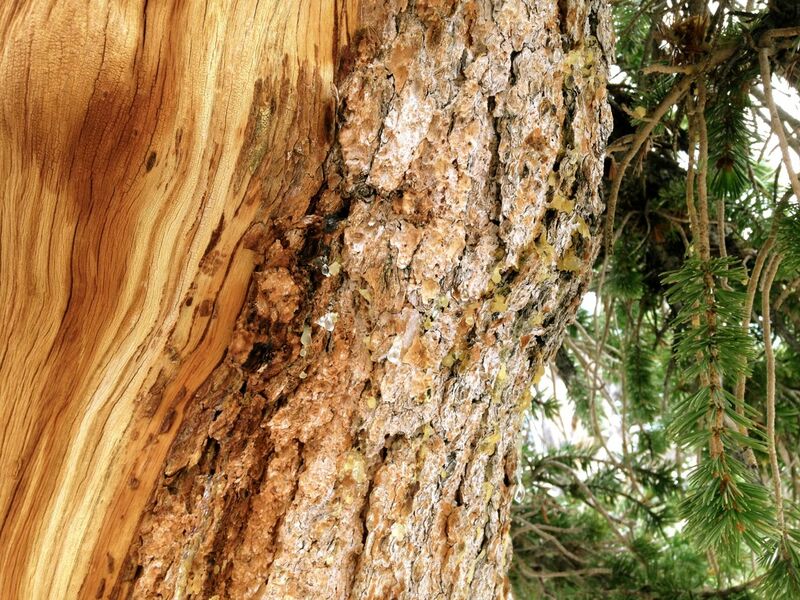 I’ll make sure you make it out.” And, bursting the sacred moment, they found an old pine with exceptional curves and burst in on the quiet couple from New Mexico to take their picture. “You need your other hand on his shoulder,” I instructed the man in the sport coat. He rassled his friend who tried not to roll his eyes. And on up the trail we went. The Englishman talked non-stop so everyone on the trail knew Will’s name (no one knew his), that they were dental students on holiday from the UK, on a three-week adventure in a rented car, trying to take in a bit of America. The chatty one was more keen on adventure. His favorite game was, when they saw headlights coming toward them, to make Will guess how long it would be before the car passed. Then speed up or slow down to make Will lose. Will was agreeable to this point but after being pulled over twice by police – “you know, just learning the rules of your roads here” chimed in his friend – Will played the quiet sage to the other one’s fool. We hiked, Will’s fool outlining their trip. They’d been shadowing a dentist uncle of Will’s as their elective with one more year of dental school to go and decided to “go for an adventure, a holiday”. They really didn’t know the man but Los Angeles was certainly busy. They’d talked the man who’d rented them the car down from $440 to $220. “It seems, in America, they tell you a price and you have to talk them down from it. I simply looked at the rental man’s computer screen – went to his side of the desk, you know – and we unchecked boxes until we got the price down to $220!” Will rolled his eyes and the talker shrugged as if it made sense. This continued into a discussion of his travels – mostly of Europe, Dubai and Kenya – mind you, all while we hiked uphill at 11,000 feet. We stopped at the end of the trail to view Nevada’s one and only glacier. “Uh-huh, a lot. I used to climb,” I smiled at him. “I used crampons when we got off the boat in Alaska. I was on a cruise with my family. The route to Japan – you know, I hate to say it but it was all old Americans – that was so boring but the GLACY-er was great.” He grinned. We took pictures of the glacier. Both young men finally saw it below the rock-face. They’d thought it was just the patch of exposed snow peeking out at the side, not the whole gravel-covered thing. I still had no idea what the name of the chatty gentleman was. 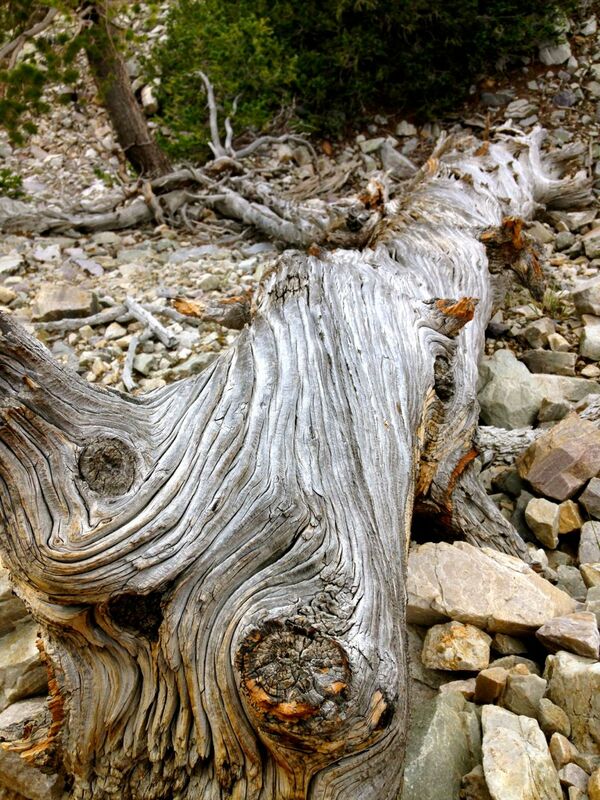 I stopped to take a picture of a particularly gnarly dead pine off the side of the trail. We headed down, Will and I listening, me throwing in little questions every once in awhile. “Where are you staying? Are you camping?” I asked. “He’s wearing a sport coat. What do you think?” Will chimed in from the back. The other one laughed. He was telling me how he liked to be cool, dry and clean and thus would never visit the American South when phone rang. “Dad, hallo! Hi. Yeah, we’re fine. I can’t believe we have reception up here. 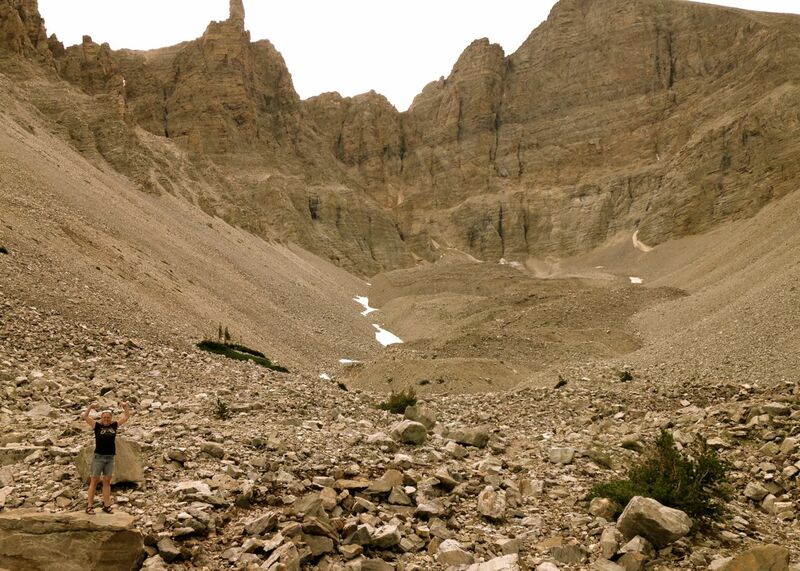 Will and I are on a trail.” The trail was wide, falling off down quite a steep hill as he held the phone to his ear. “Maybe I can call you later — we seem to be on the edge of a precipice. It’s…a little steep.” It was hardly dangerous but I wasn’t the one wearing a sport coat. “I’ll call you later. Yeah, yeah, we’re fine. Love you!” He continued talking to us after he hung up. I was just getting into the story of my road trip when they decided to break off and hike to the alpine lakes, another 2.7 miles. “Well, have a good trip then. Nice to meet you.” His sport coat was wrinkled and, I imagined, would never be the same. “Carrin,” he said, or maybe Carrey or Cairn. I would never know. We shook hands with smiles, Will shaking his head like he couldn’t believe I was leaving him with his buddy. And how could his buddy carry on at such an altitude? I said goodbye. The walk back to the campground was the only quiet part of the trip. A deer rummaged around in the forest and I spotted some kind of hawk swooping into the trees. 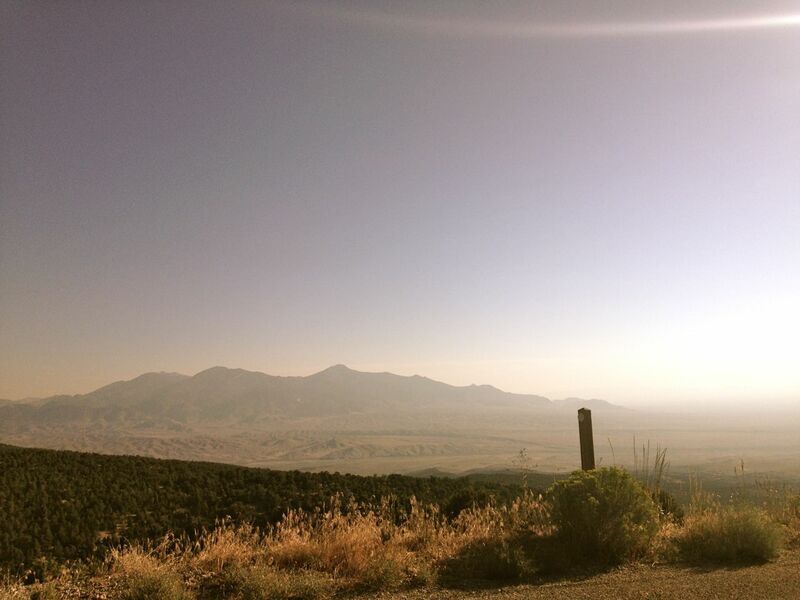 Later that night, I could see the Milky Way — the best view of the skies in the continental US. As I sat by my fire, I wondered, Had I even been to see the bristlecone pines? I barely had a moment to think. My moment of sacred was gone, lost in the words of some happy Englishman who was a pleasure to meet, and who would be remembered for wearing a sport coat on his first visit to see the oldest living things in the world. Maybe I should’ve dressed up more.